Polar Heating and Air Conditioning proudly provides the La Grange, IL community with complete furnace repair, furnace installation, and furnace maintenance services. Whether you own a home or a business, you can always expect the lowest prices and the highest quality service and equipment. Our Nate Certified furnace technicians have been trained to work on any make or model of equipment. Whether you have a gas furnace, an electric furnace, or a commercial rooftop unit, you can rest assured that you are in good hands. We have thousands of satisfied customers throughout all of Chicagoland including La Grange, IL. You don’t have to take our word for it though. Take a look at our Yelp!, Google, and Facebook reviews and see for yourself. We take great pride in our work and your complete satisfaction is our number one priority. When the time comes to install a new furnace in your La Grange, IL home or business contact the furnace installation professionals at Polar Heating & Air Conditioning. Our furnace experts have over 60 years experience installing residential and commercial furnace equipment. We offer the latest high efficiency equipment, as well as affordable standard options. At Polar you can always expect the best price on the best equipment from manufacturers such as Rheem & Amana. We stand behind all furnace installation services in La Grange, IL, and we offer unbeatable warranty protection. You can rest easy in knowing that your new furnace will provide reliable performance for many years to come. Contact us today for a FREE estimate and to discuss all available rebates and special offers. Are looking for a furnace repair company in La Grange, IL that is both honest and affordable. If so, look no further that the furnace repair experts at Polar Heating and Air Conditioning. We know that when your furnace is not working it can be beyond worrisome. While some heating and cooling companies might take advantage of the situation, it is our priority to restore your heat. You will never experience high pressure sales tactics from our furnace repair service professionals. In fact, we offer a FREE 2nd Opinions to customers that have already received an estimate from another company. This way, you can be sure of what the problem is. Our Nate Certified HVAC technicians will diagnose your problem, and explain all of the available options to you. We also offer 24 hour emergency service, as well as Saturday and evening appointments at no extra charge. 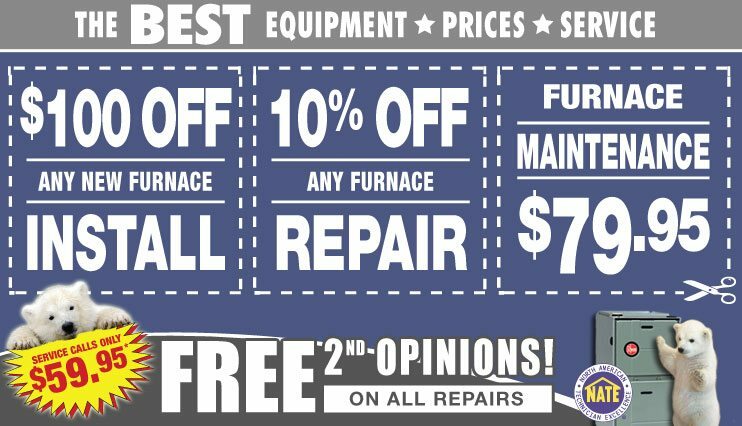 So if you are looking for furnace repair in La Grange, IL choose Polar and experience unmatched customer service. Smart homeowners know that annual furnace maintenance is the best thing you can do for your furnace. Polar Heating and Air Conditioning offers furnace maintenance in La Grange, IL at an affordable price. Our heating and cooling technicians will perform a complete inspection and cleaning of your furnace so your unit can run efficiently and reliably all season long. While some people forgo having furnace maintenance performed, it is a warranty requirement in some cases. Contact us today to find out if annual furnace maintenance is a requirement of your warranty, of simply to schedule your cleaning. We look forward to serving you.